The eBook cataloging program. Store the index of all you books. 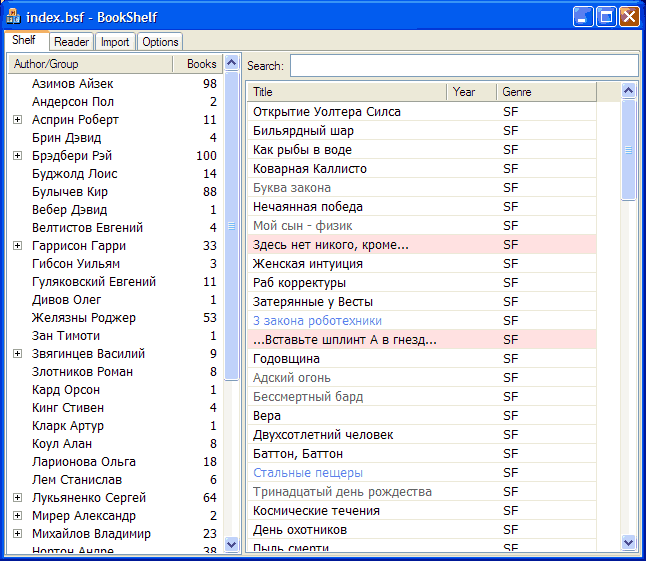 Sort books by author and group (sequence). By default stores books as ZIP file in subdirectories. Supports books in ordinary files at any place. Fast search by author/title/genre... Built in reader (derived from HaaliReader). Converts books from plain text or MS Word to FictionBook2. Supports ZIP compression. Flexible GUI settings. Supports FBE plugins. Store the index of all you books, imports and converts books to FB2 format. ...... The FB2 file is a simple XML document in any language (UTF-8 supported). *Store the index of all you books (3000 - easy!). *Sort books by author and group (sequence). *By default stores books as ZIP file in subdirectories (author\author. title.zip). *Supports books in ordinary files at any place (for example on CD/DVD). *Built in reader (derived from HaaliReader). *Shows all books what original HaaliReader can show (fb2,txt,pdb...). *Converts books from plain text or MS Word to FictionBook2. *Copyes misformated books to separate folder for future analysis. Qweas is providing links to Book2Shelf 0.9.56 as a courtesy, and makes no representations regarding Book2Shelf or any other applications or any information related thereto. Any questions, complaints or claims regarding this application Book2Shelf 0.9.56 must be directed to the appropriate software vendor. You may click the publisher link of Book2Shelf on the top of this page to get more details about the vendor.